JEDDAH: Pilgrims can now finalize Hajj e-system booking procedures through the Hajj offices approved in their respective countries, an official source at the Saudi Ministry of Hajj and Umrah told Arab News. He said the ministry is seeking to achieve the required transparency for pilgrims at all levels and types, and that the electronic path shows the costs of the Hajj services. The ministry has shifted its works to the unified electronic path and is following up feedback of the service providers and recipients, he said. The electronic path seeks to achieve the highest efficiency for the arrival and departure of pilgrims as well as the services provided during their stay in the Kingdom, he added. 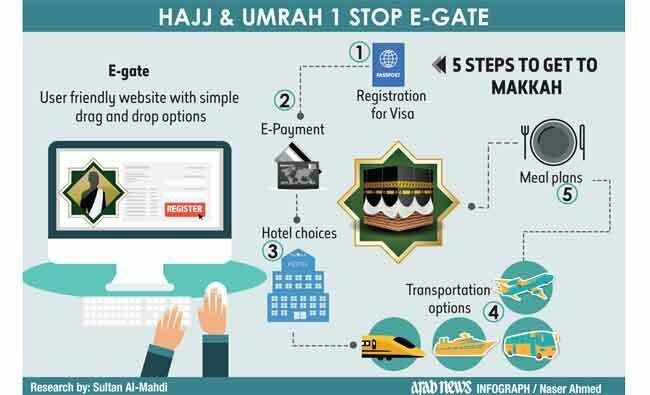 The source said the integrated electronic system comes through the linkage of Hajj visas with services such as housing, transport and food which are clearly shown to the potential pilgrims while they are still in their countries. He said the ministry can monitor the registered services so there will be immediate accountability if there is any negligence or violation in the signed documents. On the other hand, Deputy Hajj Minister Dr. Abdulfattah bin Sulaiman Mushat on Sunday patronized the launching of functions and a workshop of the unified electronic system under the motto of “integration and excellence.” The workshop, which was held at the Hilton Hotel in Makkah, aimed to raise the level of preparedness for the new Hajj season in line with Saudi Vision 2030. He stressed the objectives contained by the workshop which, he said, were to improve the electronic services provided to the pilgrims and to allow Muslims from the across the globe to perform Hajj and Umrah rituals easily and comfortably. The deputy minister said the workshop focused on strategies and contracts before and after the arrival of pilgrims, while the work plan addressed the current procedures, challenges and proposed solutions as well as outputs and recommendations based on comments and discussions.